A second factor is that the political leadership of LDS is concerned about its electoral future. With no alternative party on the horizon and voting trends suggesting a further decline in both the ruling party and LDS share of the vote, there is now a very real prospect of the Parti Lepep being voted out of power in 2020. A Parti Lepep Executive majority is no longer a foregone conclusion – unthinkable until recently. Waiting for the 2020 President elections is also not a viable alternative for LDS given the cozy relationship its leadership has with severely tainted members both within and outside its ranks. It seems denial in the LDS has been replaced by a sense of fear. The party is trying to hide from the voting public the mess that it has made. On Monday 22nd January, 2018, an interview was conducted by the “Today” newspaper with Honorable Ramkalawan, the Leader of the Opposition in the National Assembly. One of the most startling revelations in the interview was confirmation of Honorable Ramkalawan’s biased opinion of himself. This could also be seen as an attempt to deflect attention away from himself and directing attention at others. This was upon the subject of criminality and corruption where focus was directed at Ex-presidents. Honorable Ramkalawan made no mention of the failures of the various prosecutorial institutions to implement their given mandates; Honorable Ramkalawan chooses to focus only on the ex-Presidents immunity. The precepts of anti-corruption have been flying thick and thin through the National Assembly for over two decades. A case that springs to mind is the case of arms and ammunition from the ship “Malo” allegedly sold to principals behind the Rwandan Genocide that resulted in the deaths of over 600,000 people. None of the Seychellois involved in this crime against humanity have ever been held accountable. Fast forward to 2018 and rather than focus on corruption affecting current and future political events Honorable Ramkalawan buries his head in the sand. A lot can be said about his silence on the issue. Institutional corruption across the arms of democracy of our country is real threats, actual or perceived that needs to be combated. In terms of accountability it’s indeed time to catch up and restore the legitimacy of important institutions. But the stakes are very high – for the implicated politicians and their business cronies, for Ramkalawan and the LDS’ electoral future, and for the credibility of Seychelles as a trustworthy destination for much needed investment. One of the most important instruments in defeating corruption is a compulsory and detailed declaration of income and assets programme. It has been found to be very useful in many countries as a deterrent to corruption practices in the Executive and Legislative branches of Government. Another equally important and synonymous piece of legislation is the forfeiture of proceeds of criminal activity. 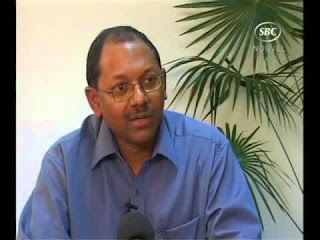 Prior to their winning the national assembly elections in Seychelles, corruption was a major campaigning issue that LDS promised to tackle when in the Assembly. Not a single whisper, over one year after, has been heard on the issue of declaration of income and assets. The law needs to be detailed to ensure that senior members of the Executive, Legislative and Judiciary are seen to observe the highest standards at all times in delivering the mandates of their respective offices. There must be provisions within the framework of the act to take account of officers who act improperly, and shown not to be fit and proper in the execution of their mandate. The problem for the LDS is this: if its intention is to make the Ex-presidents the sole-scapegoats in the corruption and criminality saga, they will be in a good deal of trouble. Of the published scandals, the evidence strongly suggests that they were not acting alone. The Ex-presidents themselves may represent only the tip of the iceberg. Top government officials and politicians of various political persuasions are alleged to have been involved in almost all instances. An example would be where a politician is found to be taking bribes from a foreign construction company bringing in illegal migrant workers in containers. This is a case where the politician is acting corruptly, whilst benefitting from the proceeds of crime. There are also private sector players who played active roles in the abuse of state procurement processes and concessions. Should they in turn be held to account, it could result in corporate collapses. Within such a context the declaration of income and assets act needs to take into account the international dimensions of criminal activity and the proceeds from the same. It needs to ensure that it is robust enough to stand scrutiny in the international legal arena, particularly in the domicile of international financial market currencies such as the USD and Euro. Given the intransigence of the LDS majority in the National Assembly to hold the Executive accountable, any move towards new elections is a deliberate ploy to stifle transparency and good governance. As the National Assembly has the power to summon the Executive to answer for non-implementation of legislation or reforms, what is holding LDS back? The prosecutorial state institutions responsible for fighting corruption have to also be made accountable. All these lies within the legal ambit of the LDS and voters should be questioning the true motives of Ramkalawan and company.